As a performer – and I was a pretty good pianist in college, it’s the regret of my life that I didn’t keep it up – I never liked the feeling of complicated tuplets that couldn’t be expected to be played exactly right. I imagine you know what I mean: septuplet quarter-notes over a 4/4 measure, or an 11-tuplet with a couple of notes missing, and the composer says, “It doesn’t have to be exact, just make sure you end the phrase on the downbeat.” I never liked cheating, and I was so obsessed with polyrhythms that I didn’t want to fudge them, I wanted to feel them and feel secure playing them. 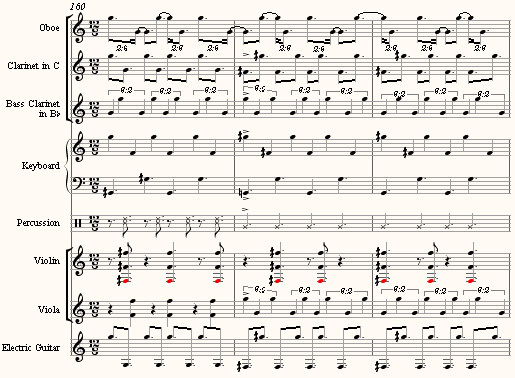 Even with an ornamental quintuplet in Chopin, I worked to get it mathematically right. I had fallen in love with the three-against-four, two-bands-at-two-tempos section of the “Putnam’s Camp” movement of Three Places in New England, and at age 14 I said to the Universe, “Sir, it will be an honor to devote my life to replicating this effect.” So the fake polyrhythms, the little flurries that didn’t need to be accurate to achieve their goal, bothered me. No. 1 plays a steady beat. No. 2 plays a triplet against every two beats of 1. No. 3 plays a triplet against every two beats of 2. No. 4 plays a triplet against every two beats of 3. This triply-nested 3:2 yields a pretty complex tempo resultant of 8:12:18:27, Drummer 4 playing 27 beats to every 8 by Drummer 1. This is exactly what Art Jarvinen does in one section of his Ghatam for sculptural percussion (1997), as you can hear here. He builds up the rhythm slowly, as a process, and doesn’t try to notate it, just gives instructions, because the notation would be needlessly complex. This is also the same rhythm, though, that Ben Johnston used in the first variation of his “Amazing Grace” Quartet, No. 4 (1973). Going up one more 3:2, to 16:24:36:54:81, Ben did notate it, using different simultaneous meters to handle the overload. (You can hear that variation here, in the brand new recording by the Kepler Quartet.) Two variations later, Ben achieves (with great difficulty for the performers) a large-scale rhythm of 35:36, the same way one arrives at it in tuning pure pitch intervals: as the difference between a 9:5 and a 7:4 (or, rhythmically, 9 in the space of 5 and 7 in the space of 4). For Ben, as for Cowell in New Musical Resources, the methods of extending rhythm flowed by analogy from traditional ways of handling pitch, which was one of the core meanings of the word totalism in the first place. The equal signs between measures indicate that the same pulse continues across the barline at that point. (No recording I know of available, unfortunately. If you know something about tuning, you can figure out the original pitches from these rhythms: taking the first as C, it continues G, E, B, D#, A#, F#…) Ben’s reputation never took off on the East Coast to nearly the same extent. But insofar as some of the totalists had been educated in the Midwest, Knocking Piece may well have been a seed that quietly (or rather, noisily) blossomed in the music of 1980s New York. You can sort of see that everyone else is playing off either the quarter-note beat or the dotted-quarter beat, which are unified in the keyboard part. The viola and bass clarinet play triplets off the quarter-note beat. The violin, less obviously, is playing 2 beats to every 3 dotted-quarter beats. The oboist, poor dear, is having to play 4-against-3 to the dotted-quarter beat, or 16 even pulses over three measures; actually twice the tempo of the violin, but not lined up in rhythmic unison with it. Here six of the lines are cued to the dotted quarter beat and three to the quarter-note beat, but one assumes that elsewhere the ratio is four lines against five, as per the title. From here on, the piece gradually floats into a more static continuum, which became typical of Michael’s music about this time. At 19:22 a viola starts up in free rhythm over the throbbing G major continuum underneath, and at 20:56 a snare drum rhythm in military time joins it, and the piece dies away. You can hear Four Kings Fight Five in its 23-minute entirety here; the rhythmic points I’ve been making are all illustrated within the first seven minutes. Please don’t get too exercised over whether you “like” the piece or not. Frankly, I don’t find it, overall, one of Michael’s most compelling works, though I certainly love parts of it – I somewhat prefer Thou Shalt!/Thou Shalt Not!, Yo Shakespeare, Trance, and the Van Gogh Video Opera, among others. The question is not whether you “like” it, but whether you understand what it offered in terms of multitempo composition. In that respect it was not only remarkable for 1988, but offered possibilities that have still not been fully explored since. What’s common to all three pieces, by Jarvinen, Johnston, and Gordon, is that the performers achieve a remarkable degree of rhythmic complexity – a true “harmony of rhythms” in Cowell’s sense – by selectively listening to some performers within the ensemble whose pulses they play off of, and having to ignore others. The ability to maintain a 4-against-3 rhythm over a steady-beat reference point, and the relative impossibility of securely maintaining a more difficult 27-against-16, is the same in rhythm as it is in pitch: a perfect fourth (4:3 pitch ratio) is easy to tune, a Pythagorean major sixth (27:16) extremely difficult. Gordon could still have gone a little farther than he did by factoring in more 5-against-4 rhythms, both as quintuplets and as quarter-notes tied to 16th-notes. I have sometimes succeeded in getting a class of students to clap 25-against-16 by conducting a quarter-note beat and having half clap quintuplet quarters while the other half clap quarter-notes tied to 16ths. Gordon goes only so far as a quintuplet over the dotted-quarter beat. I don’t know of a piece that went further in drawing so many competing rhythmic layers at the same time in a large, live-ensemble texture. It wouldn’t surprise me if Gordon’s Trance does, but I haven’t seen the score. I, too, think Ben Jonson’s great. Sadly, he’s not played much. I love Amazing Grace!